Tournament formats in gaming events have remained largely unchanged for a long time. As E-sports progresses, tournament organizers will frequently copy formats from past events, often selecting formats that are not optimally suited for their needs. In this article, we’ll take a look at 4 examples of actual tournament structures used in past Hearthstone, League of Legends, and Starcraft events, and we’ll suggest changes that would have made these events better. Getting the format right is principally important to every element of a tournament. Having a proper format can dramatically improve the quality of the experience for both the viewers and competitors. For the viewers, a good format can create a more exciting and competitive finals by being much more likely to match the best two teams together. For the players, it makes the distribution of prize money more legitimate, ensuring that the earnings are deserved. It’s very important to understand that choosing a better format that optimizes for its goals will produce a better overall outcome on average. The key word here is optimization. Usually, a tournament’s format is an optimization problem when given a schedule. Take the following as an example: a tournament involves 16 teams, must end in 4 days, and must have a maximum of 6 games per day, all played sequentially for TV. Ultimately, we try to produce a format that will deliver the best expected value with respect to our goals for the tournament. We want a suspenseful final: so the final 2 teams shouldn’t have played each other very much beforehand. We want to minimize repeats — in general, when there are fewer games between teams that have played before, it is more mathematically likely that the final standings reflect skill. Want to minimize meaningless games — in general, every game won should improve a team’s outlook in the tournament. Viewers don’t want to watch meaningless games. Games shouldn’t be strategically throwable — games lost should reduce a team’s outlook in the tournament. Teams shouldn’t have to strategically consider the tournament bracket and decide whether to concede matches; they should just be able to play to win every game. Of course, every tournament format will have tradeoffs that improve some goals at the detriment of others, but many people are not even aware that potential improvements exist. To illustrate this point, here are 4 case studies of actual tournament structures, each with a key flaw that could be fixed with a change to the tournament format. In a typical “Korean-style” bracket, 4 teams enter a group stage and 2 advance. If, in the 4th match, a>b, then the matches played form a perfect hierarchy (A>B,a>b) and B will play a for the second spot. This is all good. If b wins, then B vs b’s score was 1-1, yet b advances. If team a is much weaker than team A, then the advancement of b over B could be completely due to the pairings. After two Swiss rounds like normal Korean brackets, there will be a WW, WL, LW, and LL team by results. We then pair the 1-1 players with 1-1 players of another group. Note that this is the same as an 8 player, 3 round Swiss bracket in which teams with a record of 2-x advance, and teams with a record of x-2 are knocked out. You need to have 8 teams in the studio, and you need the number of teams in the tournament to be divisible by 8. For tournaments where this is not possible, the “Korean bracket” can be acceptable. However, in many tournaments, the games are played sequentially (such as for TV), and with this small modification, the tournament is guaranteed to be more fair with the same number of games. 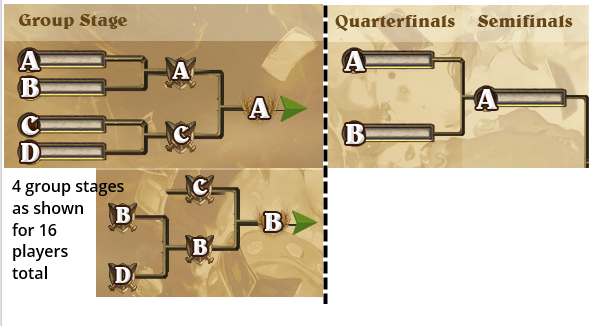 In the Hearthstone Qualifiers for the world finals, a triple elimination stage is first played to narrow the participants down to 16 players. From there, they play a Korean style bracket to go from 16 down to 8, followed by Single Elimination to go from 8 to 1, with the top 4 advancing to worlds. In this format, an average of 2.5 matches are played by each player during the phase where the tournament narrows from 16 to 8 players, but only 1 round is played to go from 8 to 4 players. This is extremely unfair, as more play should typically be given to the business end of a tournament. This is why the grand finals in many E-sports are often a best of 5 or 7 and not a simple best of 1. In the above structure, the extra play at the beginning is meaningless when the tournament devolves to 1-round sudden death when the results matter most. There’s a much better format that could be used for the top 16 in the qualifier, being both more legitimate and more likely to yield an exciting finals. Moreover, it is possible to cut to a Single Elimination tournament when there are only 4 players remaining, resulting in a Compressed Double Elimination (CDE) tournament in which the final few matches are much more exciting than those in a typical Double Elimination tournament. This solution is almost assuredly better for our case study as it ensures that the players who qualify to worlds are those who win more often in the same number of games. Let’s take a look at Compressed Double Elimination (CDE) in more detail. The exact specification follows one simple rule: when a Double Elimination tournament has 4 players left (2 in the winners bracket and 2 in the losers bracket, which is guaranteed to happen), we create a new Single Elimination bracket, pairing undefeated players with once-defeated players in a way that minimizes match repeats. But why is this better than a standard Double Elimination tournament? Double elimination has principally been unfavored for use in tournaments for a number of reasons. First, it doubles the amount of games that need to be played, which can cause issues if every game is broadcasted. On top of this, it is a slog for the lower bracket players to advance — a player that loses in the first round has to play almost twice as many matches to be on equal footing with a winner bracket player. However, most importantly, Double Elimination breaks the suspensefulness of a tournament. A typical result in Double Elimination is that you have the final two players in the winners bracket square off for a second time in the grand finals, creating less excitement. With this, the ending of a tournament becomes a huge toil of sequential games: the winner bracket finals, the loser bracket finals, the third place match, then finally the grand finals. It’s for these reasons that most tournament organizers — including most world championship tournaments — end up preferring Single Elimination. However, cutting to a top 4 Single Elimination solves virtually all of these problems. If tournament organizers were more aware that this is possible, then it is likely that more of them would elect to have the Double Elimination format in their tournament. Double Elimination isn’t the right format for all tournaments. Given that a tournament is Double Elimination, a Single Elimination top 4 only makes sense about half the time — sometimes you want it, sometimes you don’t. But there are a lot of situations where a tournament structure like Double Elimination is rejected entirely because it isn’t appropriate. In many such situations, CDE would be a perfect fit. At All-Stars: Shanghai 2013, 5 teams with players chosen from amongst their region battled to see who would be the best region. In the way the bracket was set up, the team seeded in the 3rd slot (here EULCS) could have played the best team (KR Champions) in both the first round and second round if they happened to win their losers bracket match. So if they happened to be the 2nd best team, KR Champions could have eliminated them early, and the finals would be less exciting. Also, if KR Champions lost in the second round, we’d see a similar problematic situation as we saw in “Korean brackets”: teams could go 1-1 in match score, but one of them could be eliminated because the other got paired against a weak team. In general, repeats that are not necessary are almost always detrimental to the tournament structure. The solution in the case study is simple. The match between KR Champions and EU LCS is the only match that could potentially repeat according to this bracket. Thus, KR Champions should play someone based on the results of the losers bracket match: if NA LCS won that match (as they did), KR Champions could play NA; this is fine. However, if instead EU LCS won that match, KR Champions should have played Garena and not repeated a game against EU LCS. Here is a typical 8-player Double Elimination tournament, with players A, B, C, D, a, b, c, d. In the first round, A beat a, B beat b, etc. In the second round, third match, we have a play d if A and D had opposite results; otherwise a shall play c. This is the key idea that guarantees no repeats (except possibly in the finals). The general rule is that the winner of a match will always play a team they have not faced before in their next round. The major issue here is that you need to have the results of all previous games in order to construct the next round in the bracket. Winners bracket results can influence pairings for losers bracket games, but this is likely not exploitable as no team would go as far as to put themselves in lower bracket to change the outcomes. This solution is best in TV tournaments with sequential games. In Paris, 5 teams (one from each geographic region) battled to see who would be the best team in the world. The format started with a 10-game round robin group stage, after which the top 4 teams would advance and play a 4-team Single Elimination tournament, with top-seeded team playing the bottom-seeded team in the semi-finals. Though improvements could possibly be made to the second stage, we’ll be focusing our discussion on the round robin portion of the tournament. A Round robin is a typical way to seed players in a group, and it was also used during the League of Legends World Championship (Season 3), where two groups of 5 each played each other twice, and the top two from each group advanced. 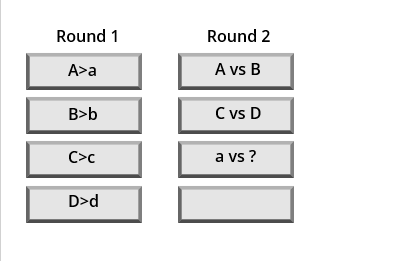 Many round robin seeding stages also employ two-tier qualification: for example, the first place team in each group receives a bye, with the remaining qualifying for the next stage. The problem with round robin qualifiers is that they can lead to many meaningless games, and potentially the strategic throwing of games. We’ve seen an example of the latter before in OGN, where League of Legends team SKT T1 S infamously lost 3 games in a row, resulting in their more decorated sister team SKT T1 K advancing. Whether there was impropriety remains anyone’s guess, but the point isn’t that sister teams should be banned from competitive play; it’s that tournaments should not be structured in a way that can create these types of situations. Another problematic situation occurs when a team that is already guaranteed to qualify can intentionally lose to change the standings. This is even possible in a 3-player round robin where each pair of teams plays 2 games: say A beats B 2-0 and B goes 1-1 with C. Then when A plays C, A could intentionally try to obtain a 0-2 or 1-1 result to guarantee that B would come third. 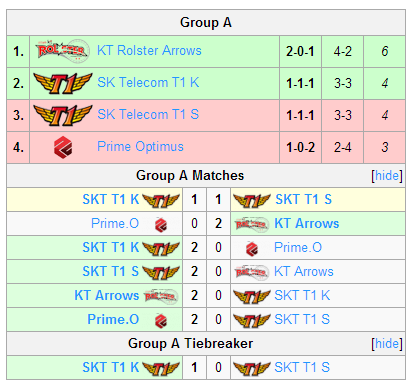 At this point in the standings (marked by the dotted line), SKT T1 K has already earned first place in the group, regardless of the outcome of the match between SKT T1 K and Fnatic. Depending on Fnatic’s position in the rankings, several less-than-optimal situations could occur. If Fnatic were very close to qualifying, SKT T1 K could choose their opponent for the next round by deciding to intentionally lose to Fnatic. 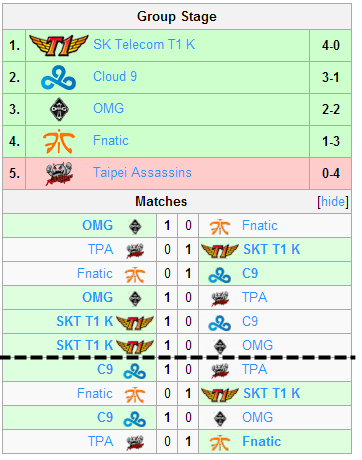 On top of this, if FNC were mathematically eliminated, then the SKT T1 K vs FNC game would be completely meaningless with respect to the outcome of the tournament. The idea of a “Smart Robin” is that you play half of a predetermined round robin schedule. Afterwards, you split teams into a top group and a bottom group. The top group consists of all teams who mathematically have the potential to be first in the group if the whole round robin were to play out. The bottom group contains the remaining teams, none of whom can be first in the group even if they could choose the outcomes of all remaining games. You then remove all games on the schedule that involve a top group team playing a bottom group team, completely skipping those matches, but otherwise finishing the round robin. The Smart Robin system is mathematically very good at identifying the best team, as well as identifying the cusp (best of the bottom group) very well. Spaces in between the leader and the cusp are not as accurate, but this is not too important. This Smart Robin system is ideal for tournaments that seed a large group of players out of a round robin, and works in cases of both one tier qualification, and two tier qualification (where the first place team gets a bye). Most importantly, the Smart Robin system considerably reduces occurrences of problems of the nature listed above. The only real tradeoff made is that the places in between first and the cusp are less accurate. This isn’t usually an issue. Also, if the number of teams that qualify is low with respect to the size of the group, the Smart Robin system can be unfair to teams close to the top who can’t qualify because they are unable to play bottom teams and thus can’t get enough wins to qualify. Generally, a group has to qualify half or more of its members for Smart Robin to be effective. Between Swiss Seeding, Compressed Double Elimination, Dynamic Brackets, and Smart Robin,there are many ways to improve tournament formats that have gone largely unchanged. I hope tournament organizers consider these ideas, as ultimately they improve viewing experiences and make tournament results more reflective of player skill.